Famous for its summer festivals, which see over half a million visitors, artists and performers descend on the city to sample the cultural delights of the International Festival, Edinburgh Festival Fringe, Film Festival, Book Festival, Art Festival and Edinburgh Military Tattoo, Scotland’s capital is also a fantastic place to explore all year round. 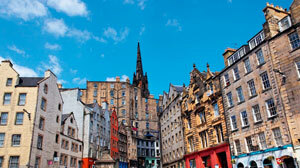 It’s a city of two halves: the medieval Old Town, with its steep cobbled streets, atmospheric underground vaults and vibrant university hangouts; and the genteel New Town, whose wide Georgian boulevards house some of Auld Reekie’s most elegant shops and restaurants. Linking the two are Princes Street Gardens, which were created following the draining of the Nor Loch in the late 18th-century. What was once a fetid lake is now a charming public park, itself split into two parts by The Mound, an artificial hill built from excavated earth that is now home to some of the city’s most notable institutions, including the National Gallery of Scotland and the headquarters of the Bank of Scotland. Standing resplendent over all this is Edinburgh Castle (+44 (0)131 225 9846; edinburghcastle.gov.uk), parts of which date back to the 12th-century. The rock on which it stands, an easily defendable crag with sheer cliffs on three sides, was formed by volcanic activity around 340 million BC, and has been the site of human settlement since 900 BC. The castle has been rebuilt and renovated at various points in history and has changed hands between the Scots and the English in wars of independence down the centuries, making it a fascinating living record of Scottish and British history. Go first thing in the morning to avoid the crowds and look out for the excellent, free guided tours that take place regularly throughout the day. There’s plenty to see, but be sure not to miss the serene beauty of St Margaret’s Chapel, the oldest part of the Castle, and the engaging Prisoners of War Exhibition, which is located in the fort’s dungeons. The view of the city and its estuary – known as the Firth of Forth – from Castle Rock is breathtaking, but to get a sense of the former royal residence in relation to the city it overlooks, you’ll need to get a little perspective and there’s no better place for that than the top of Arthur’s Seat. This long extinct volcano, the highest hill in Holyrood Park, rises to a height of 251 metres and can be climbed from a number of different routes, the easiest of which takes just 15 minutes. The panorama is spectacular and the feeling of being battered by strong winds hugely enervating. On match days, listen out for the roar of the crowds from nearby Meadowbank and Easter Road Stadiums, home to Edinburgh City FC (www.edinburghcityfc.com) and Hibernian FC (www.hibernianfc.co.uk) respectively. As is hardly surprising for the city that hosts the world’s largest arts festival, Edinburgh is well equipped to welcome culture-vulture visitors. The National Galleries of Scotland (various locations; +44 (0)131 624 6200; www.nationalgalleries.org) are home to a remarkable collection of Scottish and international art and host visiting exhibitions of worldwide importance. The city also boasts a number of smaller galleries, both public and private, but one of its most unusual artistic treats is only open to visitors in the afternoon on the second Sunday of each month (18 April and 9 May). The Mansfield Traquair Centre (15 Mansfield Place; +44 (0) 131 555 8475; mansfieldtraquair.org.uk) is home to an extraordinary series of murals by Phoebe Anna Traquair, the leading artist of the Arts and Crafts movement in Edinburgh. Her murals, which adorn the walls of the enormous former Catholic Apostolic Church, show sequential scenes from the Old and New Testaments and are truly lovely to behold. On the music front, the Jazz Bar (1A Chambers Street; +44 (0) 131 220 4298; thejazzbar.co.uk) is considered one of the UK’s top jazz venues. It’s also surely the hardest working, hosting three or four gigs a day, every day, often shutting up shop as late as 3am. For theatre, The Traverse (10 Cambridge Street; +44 (0)131 228 1404; traverse.co.uk) is a sure bet: it specialises in new writing, presenting its own productions, as well as those of acclaimed visiting companies, in its two versatile spaces. Central Edinburgh may look like a manageable size on a map, but anyone who has spent any time there will have learned that the city’s hilly topography can make a short walk into an exhausting climb. The good news is that Edinburgh boasts plenty of top quality restaurants where you can recharge your batteries and fill up on inspired international cuisine at very reasonable prices. The Scottish may be known for their love of all things deep fried, but there’s much more to Edinburgh’s food culture these days than greasy takeaways. The Outsider (15 George IV Bridge; +44 (0)131 226 3131), along with its sister restaurant, The Apartment (7-13 Barclay Place; +44 (0)131 228 6456), offers modern European dishes and a wine list whose quirky, imaginative descriptions will make you smile. When booking, ask for a table with a view of Edinburgh Castle; by night, it’s an awesome sight. A more informal, but no less impressive, option is Bon Vivant (55 Thistle Street; 0131 225 3275; bonvivantedinburgh.co.uk), a charming New Town gastropub with a daily changing menu of small, tapas-style plates. For an after-dinner drink, try one of the extensive range of malt whiskies on offer at the Thistle Street Bar (39 Thistle Street; +44 (0)131 478 7029), just a few doors down from the Bon Vivant. You might struggle to find a seat at this tiny pub, but the friendly staff and cosy atmosphere make it worth squeezing in. Also in the New Town, but with an entirely different feel, is Forth Floor at Harvey Nichols (30-34 St Andrew Square; +44 (0)131 524 8350; www.harveynichols.com). There’s a restaurant, a brasserie and a funky cocktail bar, all with phenomenal views of the city on one side and the Firth of Forth on the other. No euro, no sterling – will currency be the straw to break Salmond’s back?